This adorable prize package features 3 books including a copy of M.C. Goldricks new I Spy with my Little Fly book Easter! 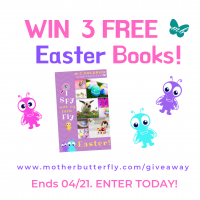 An additional 10 lucky readers will win ebook copies of Easter! Bonus: In this giveaway everybody is a winner! All entrants get a free activity book!